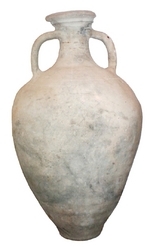 This is an amphora with flat ringed base. The rim is made by turning the clay back on itself with a double external eversion; the upper part is rounded; a circle of relief is at the level of the upper attachment of the handles and the junction of neck and rim. The body is ovoid in shape and the handles have a central groove (Laubenheimer, 1985). First century AD (Widemann et al., 1978). A number of workshops are known in Gallia Narbonensis: Corneilhan (Hérault, Laubenheimer, 1985), Marseille (Bouches-du-Rhône: Bertucchi, 1992: Fig. 55(Bertucchi 7A)), Ponteilla (Pyrénées Orientales). It was also made outside this region at Chartres ( Eure-et-Loir, Sellès, 2001: 149-151), Noyon (Oise, Laubenheimer, 2003), Châlon-sur-Saône (Saône-et-Loire, Olmer, 1996), Sens (Yonne & Laubenheimer, 2003) and in the Bordeaux region (Berthault, 1992: Fig.2). A regional distribution for this form produced outside Gallia Narbonensis (Remesal Rodríguez and Revilla, 1991). The Narbonnensian type has a distribution both within the region and outside, but the latter is sporadic. Amineum wine, from two tituli picti from Fos-sur-Mer (Laubenheimer, 2004: 163). Capacity: 29 to 30 litres for the Corneilhan type which is smaller than those found in Sens or at Châlon.